Can you find the patch on the top?? Wow! It’s starting to look like a real cabinet. This entry was posted in patch, tool cabinet. Bookmark the permalink. 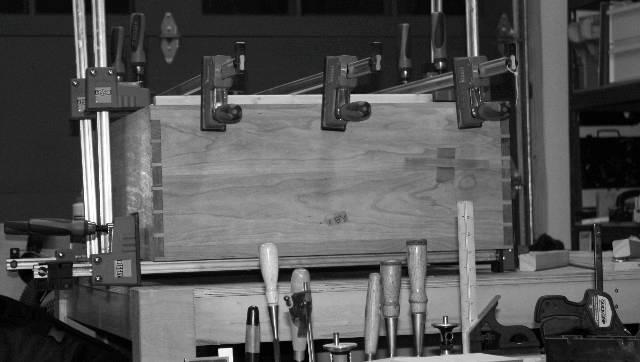 4 Responses to More tool cabinet progress ..
And an excellent soap box it is! They air brush?? Oh brother! One of the reasons I really love Marc and Shannon's stuff is that they show their mistakes and how to fix them. Marc got me to write a post on his site about how he helped me fix my mistakes in my first guild project -> http://thewoodwhisperer.com/marilyns-chest-of-drawers/. I think talking about your mistakes is critical. Nothing frustrates me more than a book, video, dvd , etc. that glosses over them. When I first started woodworking, I was a Norm devotée. But it used to drive me nuts when he'd check for square on a cabinet he was gluing up and would always proclaim, "Yep, it's square." It took me a couple years to find out how to adjust the clamps if it wasn't square.Your cabinet is looking not only square, but fantastic! Your hand tools will have a happy, handsome home before you know it.